When Gregor Mendel first discovered the units of heredity called genes, he had no idea the degree of complication of the structure of DNA. The collaboration of many scientists later showed that DNA was arranged in a complicated model of sugars, phosphate groups and nucelic acids known as the double helix. The sugars and phosphates form the sides of the ladder while the nucleic acids make up the rungs. DNA molecules are highly condensed, elaborate structures that contain large amounts of genetic information. First discovered by Friedrich Miescher in 1868, DNA was studied by researchers such as Erwin Chargraff, who compared DNA across different species, and Rosalind Franklin, who examined DNA molecules with X-rays. Elaborating on the work of fellow scientists, James Watson and Francis Crick proposed in April 1953 that the genetic material was arranged in the double helix with a sugar phosphate backbone and nucleic acid rungs. Four types of nucleic acids are found in DNA: adenine, thymine, cytosine and guanine. Nucleic acids, also known as bases, serve as the building blocks of DNA. The orderly sequencing of these bases makes up the genetic code of a single strand of DNA. When two strands combine to form the characteristic double helix structure, nucleic acids pair up to form the rungs in the center of the helix. The nucleic acids of DNA divide into two groups, with adenine and guanine called purines, and thymine and cytosine known as pyramidines. The purines have a chemical structure in which two rings of atoms join together. The pyramidines have a single ring. The ring structure has an important role in the way two strands of DNA attach to form the double helix. To form the rungs of the double helix, nucleic acids bond in a manner known as complementary base pairing. This pairing is not random; single-ringed pyramidines will only bond across the helix with double-ringed purines. Specifically, adenine always pairs with thymine and cytosine always pairs with guanine. As the complementary base pairs find each other, they attach through a series of hydrogen bonds, and a set of antiparallel strands of DNA become one winding double helix of genetic material. LaRoche, Carolyn. "What Are the Rungs on the DNA Double Helix Made Of?" 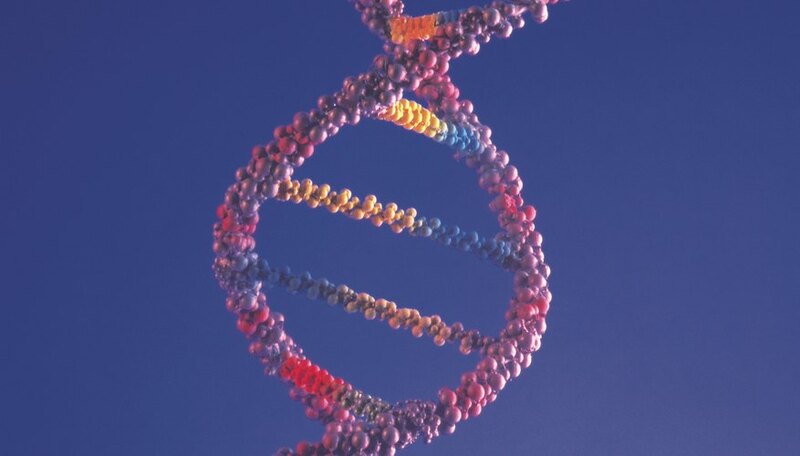 Sciencing, https://sciencing.com/rungs-dna-double-helix-made-of-2960.html. 25 April 2017.